At 2009 Frankfurt Motor Show Toyota displayed two concept models of the iQ mini-car tuned and trimmed by the company to show their understanding what the streets want! There is the iQ Collection which is nothing but a new upholstery for the interior and full glazed roof plus white color for the center console. 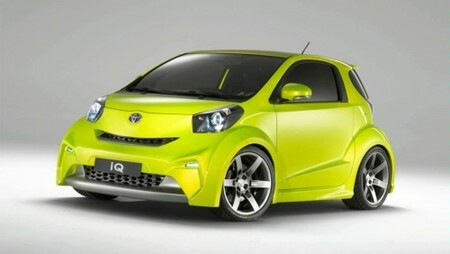 Then there is the iQ Sport, which comes with a nice body kit. This is much more like it! The iQ sport features an aggressive new front bumper, flared wheel arches to house its massive 18 inch wheels, central exhaust pipe at the back plus a roof spoiler. The sport also sports LED driving lights! Inside the cabin the iQ Sport features illuminated door handles, a swiveling spotlight on top of the dash, an illuminated iQ logo and trim panels crafted in raw nickel and aluminium. It also has bright green and grey upholstery, with contrasting bolsters in a matt-black scuba-style polyurethene and a DVD multimedia system with a 10-inch monitor.